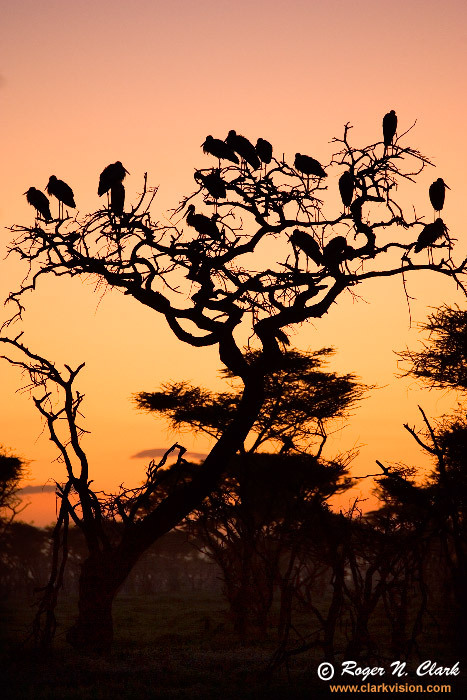 A beautiful sunrise with storks in trees in Ngorongoro Conservation Area (NCA), Tanzania, Africa. The storks stayed overnight in the trees then flew to the Serengeti during the day to feed, returning at sunset to their trees in the woodlands of the NCA. Technical: Canon 1D Mark II 8-megapixel camera, 70-200 f/4 L IS lens. Exposure: 1/10 sec at ISO 200, 185mm, f/4. Full image, no crop. Camera on a beanbag from the roof of a safari vehicle.